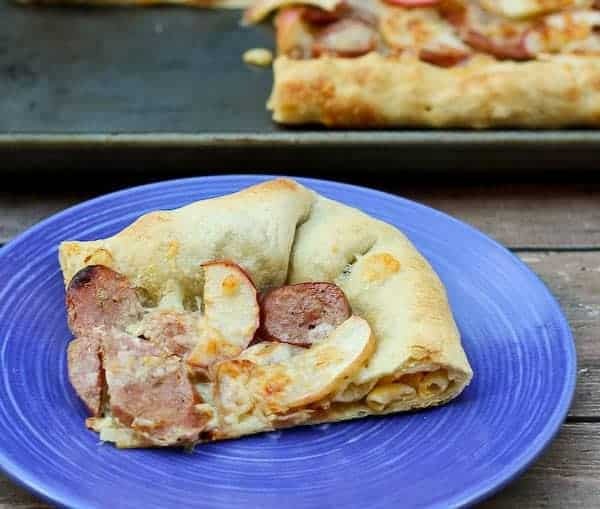 The apple and chicken sausage pizza is full of great fall flavors — and has a fun macaroni and cheese surprise waiting in the stuffed crust! 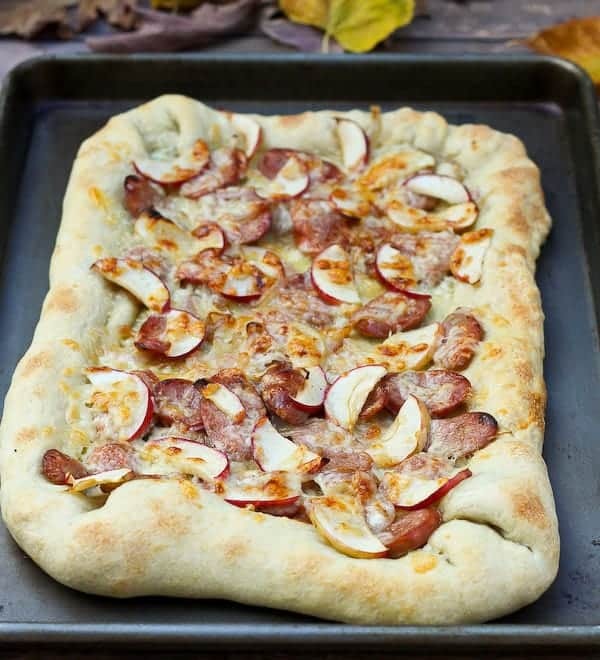 “Heeey there, I’m a classy pizza — I’ve got sausage, but it’s chicken and apple sausage. Oh yeah. And onions — but not regular onions, these are sweet red onions. And oh yeah, apples…’cause you gotta put fruit on pizza to throw people for a loop. And only the sharpest, most flavorful cheddars will work for me. Yep – I trashed it up a little and it was a gooood decision. This “trashed up” pizza is in honor of Jessica Merchant — the hilarious, innovative, and seriously sweet blogger behind How Sweet It Is. Jessica not only just released her first cookbook but she’s also going to have a baby! Today we’re celebrating Jess and her little one with a “trashed up” baby shower — full of over-the-top, Jessica-style foods. Jessica has a gift for turning the ordinary into something slightly outside of the box. Her recipes, although they clearly could only come from her mind, are made approachable for the everyday home cook. Even the “trashed up” recipes. Jessica, although she has served as an inspiration to countless new bloggers (including myself! ), is one of the most down-to-earth, kind people I’ve come across while blogging. She’s totally famous (you are!) and yet always makes time to respond to emails and acknowledge retweets, etc. Congrats Jessica (and Eddie!). Can’t wait to “meet” your little one. Circling back around to the pizza — when I heard trashed-up, it didn’t take long for my mind to go to macaroni and cheese stuffed crust pizza. I couldn’t wait to try stuffing one of my favorite foods into the crust of pizza. But then I got a little stuck when it came to toppings. Of course, you could top this pizza just like any other pizza. It would be great with marinara, mozzarella, and pepperoni. I even called my mom. She always has the best recipe ideas. So does Ben, surprisingly enough. The guy that would rather I NOT put macaroni and cheese in his pizza crust. Or mess with his chocolate chip cookies in any way, shape, or form. The guy who would happily eat tuna noodle casserole daily. But I’m getting distracted from my point here. Deciding on toppings for this pizza was hard! And truth be told, the apples sort of come around by accident. I was going to do roasted broccoli with the chicken sausage but then homecoming week happened. As I write this, we’re in the middle of Ben’s first homecoming as a high school principal. So as you can imagine, we are busy with all sorts of events. Well, mostly him but that means less help with the kids which means….moldy broccoli because I didn’t get around to it. SO — apples. And oh my goodness, am I glad the broccoli got moldy. And you KNOW I love roasted broccoli. 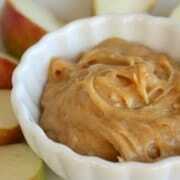 But the apples were so good on this and made it the perfect taste of fall. I served it with roasted delicata squash and I felt like I died and went to fall heaven. If the macaroni and cheese is too much for you or you’re watching that good ol’ waistline, these toppings would be great on a plain whole wheat crust. 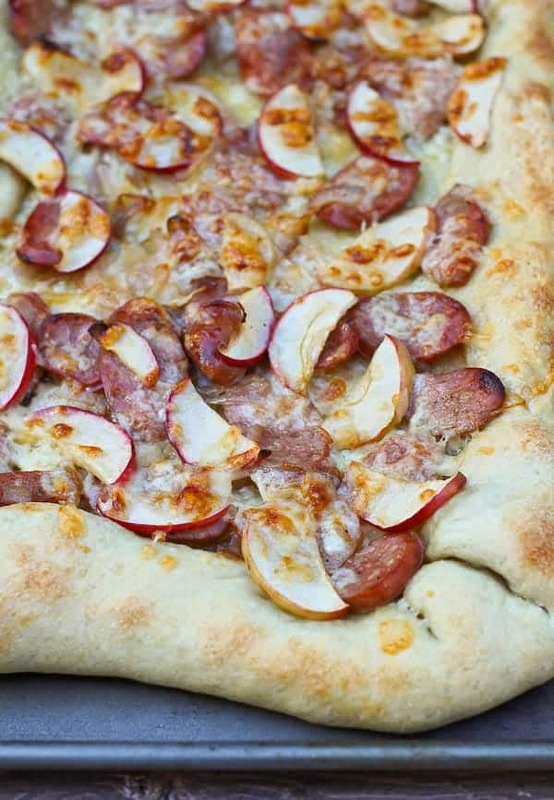 Or if the apple/cheddar/sausage thing isn’t for you, go ahead and dress this pizza up anyway you’d like. I have a hunch roasted broccoli would be good on it. As long as there isn’t mold involved. Preheat oven to 450* Fahrenheit. 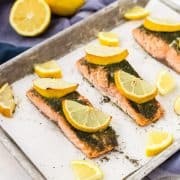 Rub a large sheet pan with a light coating of olive oil (about a teaspoon). In a medium sauté pan, heat olive oil over medium heat. Sauté onion and sausage with olive oil about 4-5 minutes or until onions soften and sausage starts to brown. Meanwhile, roll out crust to a size slightly larger than your sheet pan. 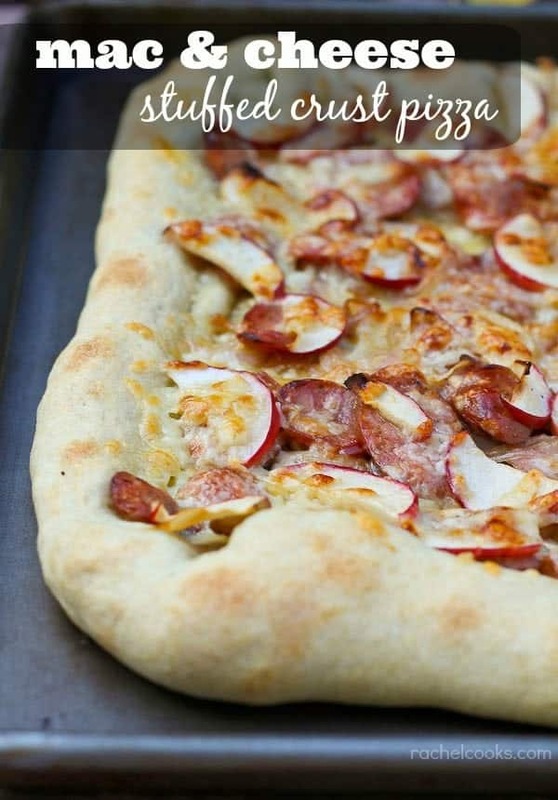 Place onto sheet pan with dough overhanging edges slightly. With a small spoon, spoon macaroni and cheese onto edges of the crust, about an inch in. Go all the way around — a small amount is sufficient. Then, fold the crust over the macaroni and cheese to form a stuffed crust. Layer on the sausage and onions, followed by the sliced apples and the grated cheddar cheese. Bake at 450 for 10-13 minutes or until golden brown and cheese is bubbly. Let cool 1-2 minutes before cutting and serving. Note: I recommend a chicken and apple variety sausage to amp up the apple flavor. Have fun looking through all these creative trashed-up recipes made in honor of Jessica and her baby! And be sure to pop on by her site if you get a minute to say congrats — both on the baby and her other baby, the book! 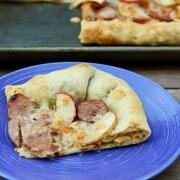 Definitely, your apple and chicken sausage pizza with macaroni and cheese stuffed crust is awesomeness! 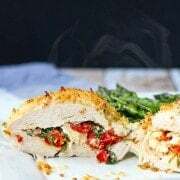 This is a great recipe Rachel, as you know I made it a short while ago and it was lovely, in fact, have made it again since. Thanks for sharing! Wow! This apple chicken sausage pizza macaroni and cheese stuffed crust is incredible! I’m seriously so inspired right now. I need to add bell pepper to recipe and it would be perfect. Thx for sharing! I’m so happy to hear you liked this! Wow, what a combination of flavors and textures! This is just too much genius. I bet you kids absolutely loved this one! That crust looks amazing! Never heard of that being done before! This is CRAZY AWESOME rachel!!! Love it! Happy baby to Jessica! Look at that thick crust. I’m lusting for it!! Amazing! 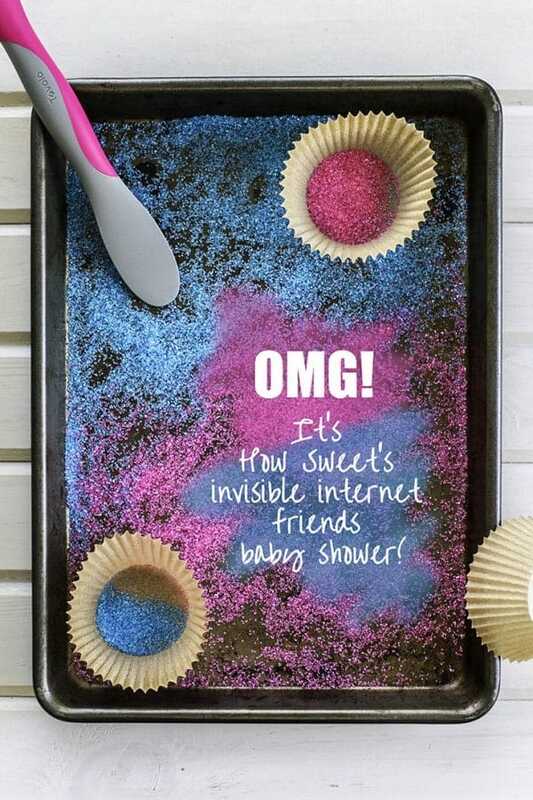 Thanks for sharing this for Jess’s shower! WHAT DID YOU DO?! Mac and Cheese inside the pizza crust? OMG I need this for dinner tonight! 3 of my most favorite things. Pizza. Stuffed Crust. Mac and cheese. Seriously? Could it get any better?! At first I was all, apple on pizza? 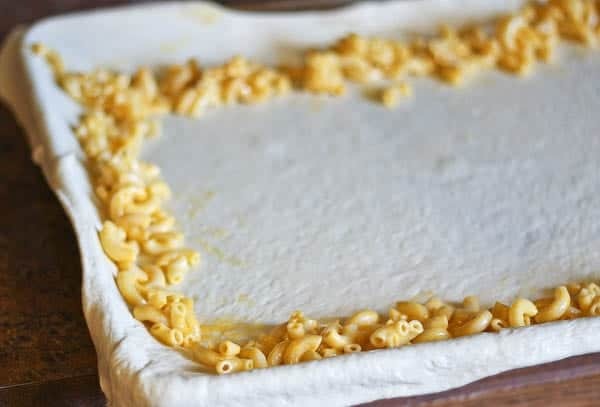 But with every word of this post you won me over a little more, until we hit the MAC AND CHEESE crust and I was a goner! This just looks too crazy good. Carb on carb action? I’m in!! WAAAAAAAT. You win at life. xoxoox! Omg. No you didn’t. You did. And this is me freaking out. So epic, girl. I LOVE it!! THAT IS SO BRILLIANT! I’m so impressed! This is creative on a totally crazy level! I can’t even imagine how good this must taste. Shut the FRONT DOOR, the back door, all the windows!! Mac and cheese in the CRUST?! I just died!! Oh my, this is amazing! So dang creative. I’m loving all of these trashed-up recipes. I love that you call your mom!! I miss her and her parsnip cupcakes!